I have a couple questions to any of yall that do concrete driveways professionally since i figure youll know this better. Our current driveway was gravel but that has all sunk into the ground with the dirt ending up on top.. Ive been wanting to just get a concrete mixer and doing it in like sections of blocks (maybe like 5'x5' squares or something like that kinda like how walkways are done).. but all i ever hear from anyone i mention it to is whining how you NEED to do it in large slabs (10'x10' or larger...)... Right now all im really wanting to do is make pads or something like that for the vehicles to park on instead of sitting in the yard or dirt where everytime it rains turns the ground into a mudpit under the vehicles..
1. Is it true you really dont need a gravel base, wire mesh and rebar to pour the fiber version concrete? 3. Is it really more cost effective to do the fibermesh or no? 4" thick slab with mesh and poss will support a medium truck without cracking. It would be best to pour 10 x 10 pads, but you do what your capable of, as long as you put an expansion joint in it. My garage floor is 60 x 30 1 expansion in the middle, and has no cracks in 35 years. Even after the earthquake. It's so hard when I was building the wall for the office, it burned up the hammer drill bits faster than I could drill the anchors. 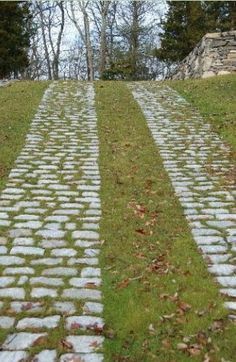 this was kinda 1 idea i was thinking of (dunno what this styles called where grass can grow in the middle so made it a pain to search for.. just came across the pic but doesnt have a name with it since it was on pintrest).. but instead of the paver stones... would be more like slabs of concrete for the tires to sit on like a walkway path..
Our driveway is 32' by 32' and was poured in 8' squares using the wire instead of rebar at a depth of 4". The expansion joints were sealed. The driveway is about 25 years old with no sign of cracking.